Quell is a product designed to cut into the medication and pain treatment space by putting nerve stimulation technology into a sleek device that can be worn throughout the day. Supporting Android and IOS connectivity, the device can automatically adjust the treatment levels to ensure that users are always getting the proper therapeutic application. Pain management is one of the biggest challenges for doctors today and treatment alternatives aren’t exactly flawless. Many prescription medications are addictive and can leave patients worse off than when they began. Avoiding drugs, intensive nerve stimulation therapy is also popular and generally effective at relieving pain. The treatment works by placing an electrode-emitting device on the ailing areas of the body. The electrical signals from the device cause the body to release opioids – the body’s natural pain relief chemical – through the entire area. Although intensive nerve stimulation therapy has been proven to help with lower leg and back pain, diabetic neuropathy, and fibromyalgia, medication still remains popular as patients have historically found it extremely easy to self-administer. Quell is hoping to bring a similar ease into nerve stimulation therapy. To get started, the user simply needs to snap the electrode into place – it’s like slipping an iPod into an arm band – wrap the band around the upper calf (or above the knee on the lower thigh), and then click the button. Each therapy session is one hour long and pain relief usually begins after 15-20 minutes. The Quell is programmed to run every other hour, however the settings can be changed with the companion mobile app. Users can also use the button on the electrode device to manually increase or decrease the intensity of the treatment while it is happening. In addition to being a pain reliever, Quell also uses algorithms and an accelerometer to provide insights into your sleep routine. Rather than just measuring sleep stages, Quell takes things a bit further, tracking items like: position changes, leg movements, time out of bed, and the amount of time you sleep on each side. 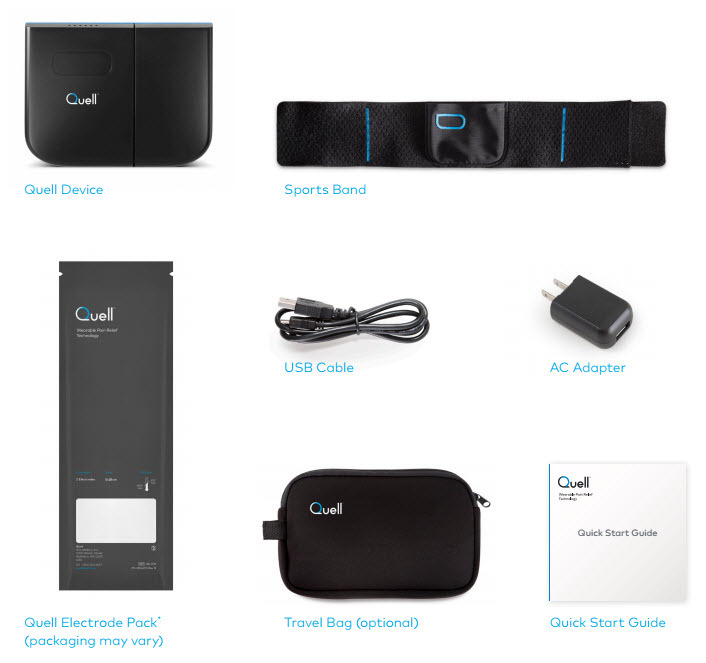 Although it’s designed to be extremely safe, Quell can’t be used by people with a pacemaker, implanted defibrillator, or any other metallic or electronic implanted devices. It is usable by expectant mothers as long as it is placed on the upper calf. Quell is a product of NeuroMetrix, a medical technology company founded in 1996 which is a spinoff from the Massachusetts Institute of Technology. You can purchase Quell off the official product website. The starter kit, which includes the device and a one month supply of electrodes costs $249.00. Ongoing monthly supplies of the electrodes cost $29.95, however discounted three and six month packs also are available. While most insurance plans won’t cover the cost of Quell, many users can use apply the cost to their Flexible Spending Account (FSA). This is a nice niche to break into. So many people are fed up with dealing with pain meds and lets not forget those that are addicted to them. Its worth a try if the cost would not break the bank. I have “light” chronic back issues and I think this would be something that I could easily figure out. If what is said goes to be true, I could see using less medication and being more active as well.